OKLAHOMA CITY (AP) – U.S. Sen. Elizabeth Warren is urging Oklahoma teachers to vote for candidates who support public education and are willing to increase the state’s education budget. 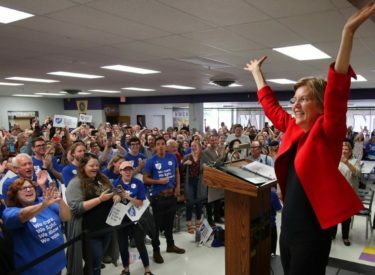 Warren, a Massachusetts Democrat who is considering running for president in 2020, spoke to rallying teachers Saturday at her alma mater, Northwest Classen High School in Oklahoma City. More than 50 Oklahoma teachers are candidates for legislative seats on Nov. 6. Oklahoma teachers walked off the job in April to protest a decade of budget cuts that left classrooms without resources and caused many educators to move to other states. Oklahoma lawmakers approved a tax-hike package to fund teacher pay raises amid a national uprising of educators seeking more classroom money. Teacher walkouts started in West Virginia and spread to Kentucky, Oklahoma, Arizona and Colorado.